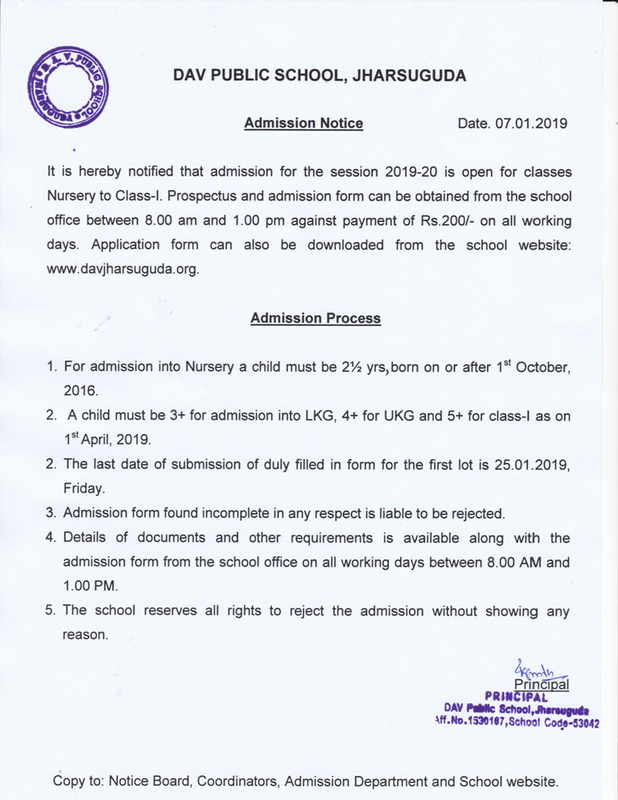 DAV Public School School in Jharsuguda under the supervision and control of the D.A.V College Managing Committee, New Delhi has been functioning with the able administration of the Local Managing Committee, who is always with constructive suggestions and immediate solutions at the hour of need of the institution. This school is up to Senior Secondary and is recognized by both Education Department of Odisha and Central Board of Secondary Education, New Delhi. The School had its modest inauguration on the 1st Sept 1997 by then District Magistrate Sri C. J. Venugopal in the presence of the Ex-Regional Director Sri R. C. Munjal and Deputy Director Shri H. S. Chhillar. It started the first academic session on 23rd March 1998 with a group of dedicated teachers. At the beginning school was running in rented building with classes from Nursery to Std-V with the decision to open the next higher class to the existing classes each year, up to senior secondary level. The students are nurtured and guided under well-trained staff of outstanding merit with a passion and commitment for helping the students to grow up as men of characters and responsible citizens. Besides curricular, co-curricular activities are also given importance right from Nursery. The students are exposed to various competitions organized in and outside the school and are also encouraged and trained in their respective fields of interest. Our School keeps the aura of Indian Vedic culture as a natural practice in its curriculum. The students and teachers are proud participants performing Hawans and Yagna amidst chanting of Gaytrimantra which keeps one's soul and mind purified.